When hotels have unbooked rooms they sell them online at a discount. When photo booth companies have unbooked photo booths they sell them on this website for less! Real Photo Booth fun is no longer limited to upscale parties! Optional: website, guestbook, graphics, digital files, acrylic frames, idle-time, etc. Call or e-mail now to check availability and reserve your date. Your guests will be Thrilled and excited to use the photo booth. Everyone will be entertained all night around the photo booth. Your friends and guests will share their printouts with each other all night, the next day and for years to come! These are NOT typical boring snaps that don't capture your guests' real personalities. 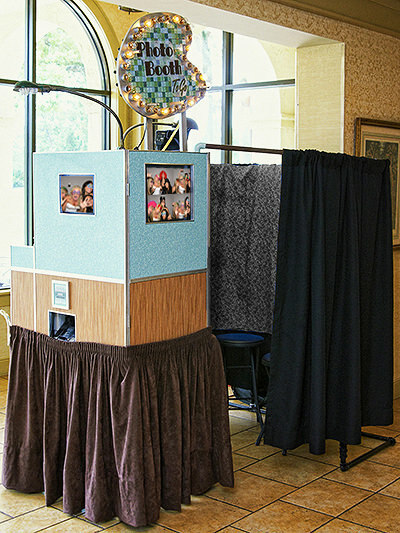 Give your guests the opportunity to have a blast behind the curtain of our fully-automated photo booth! You'll love seeing your friends and guests acting crazy in the booth! You've heard the phrase a picture is worth a thousand words, the photo booth pictures will be worth much more as they will be enjoyed for years to come. (better than throw-away party favors) They may even show up at the office or stuck to the fridge --bringing back memories of the fun had by all for years to come! based on the terms of their service contract. Minimum hours may apply for prime dates and locations, call for details. If your date isn't currently available, we may be able to source a booth for you closer to your event date.